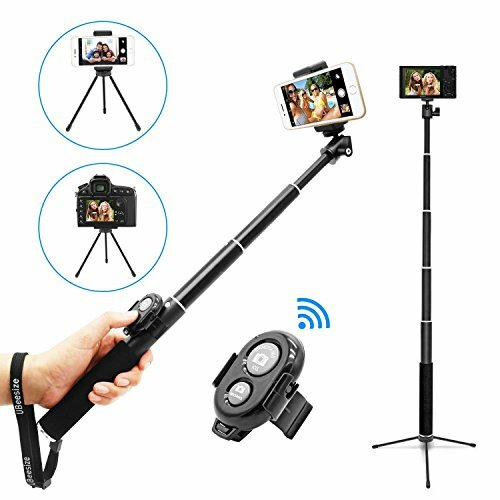 More Than A Selfie Stick: Comes with tripod stand and wireless remote control, switch the selfie stick to a tripod easily for steady shots. Mini ball head designed for 360 degree capture of views, perfect for outdoor activities. Highly Adjustable: Extendable height from 9 inches to 31.9 inches, small enough to fit in your pocket and long enough to get a large group photo, simply twist clockwise to lock at any length you desire. Great Durability: The fine aluminum tube stick and sturdy tripod stand ensure long-term durability, while soft foam coating and a wrist strap provide better grip on the handle. Control the Camera Anywhere: A detachable remote shutter allows you to take picture/video freely from distance (up to 30 feet/10m). Easily paired with iPhone and Android Phones. Widely Compatible: Works well with most cameras - standard 1/4" thread interface suitable for all phones up to 3.54 inches wide. Ideal for iPhone, Samsung, other Android phone, digital camera, Gopro sport camera. If you have any questions about this product by UBeesize, contact us by completing and submitting the form below. If you are looking for a specif part number, please include it with your message.